Samuel Adams, widely believed to be the instigator of the Boston Tea Party, once said that it didn't take an activist majority to prevail, "but rather an irate, tireless minority keen to set brush fires in people's minds." Setting brushfires requires attitude, especially during a time described by Adams, "when vain and aspiring men shall possess the highest seats in Government, (and) our country will stand in need of its experienced patriots to prevent its ruin." The following describes an attitude that, if widespread, would vastly improve the incentives of lawmakers to honor the principles of limited government. Being likeable isn't needed for a person to succeed in America. An insufferable jerk can build a billion-dollar corporation from scratch, employ thousands, save the whales and cure cancer. What he can't do is win an election. To gain votes in a democracy, a candidate must be likeable. The reason political campaigns feature photos of the candidate's family and pets is not because they want voters to assume that he or she has a responsible record on taxes and spending. Therefore, the last thing that should ever impress a Tea Party activist is a politician who's a "nice guy." Simply put: They're all nice guys, so get over it and ignore it. Hold them accountable for their deeds rather than their smile. The Tea Parties are a reaction against a lot of very nice guys doing very bad things. 2. Tea Party activists don't presume virtue in party labels. Political parties are extensions of the politicians that they elect. They are mere instruments to gain power, not virtuous machines that exercise that power in noble ways. Example: During the term of President Bill Clinton, the budget actually had a brief surplus, while spending soared under President George W. Bush. Likewise, while Michigan Republican lawmakers boasted of their collective resistance to the $1.4 billion income and business tax hikes passed in 2007, most of them voted for most of the increased spending it funded. There are countless other examples. An experienced patriot treats the promises of politicians and political parties with equal (and substantial) skepticism. Use political parties only as tools toward your ends, not theirs. Your loyalty is too valuable to sell so cheaply. 3. Tea Party activists really know their own lawmakers' voting records. If the "nice guys" aren't a reliable source for a full and accurate picture of their records, and the party label doesn't do it either, then experienced patriots need to find this information on their own. At the state level, two free tools make this much easier in Michigan. The first is MichiganVotes.org, which provides a plain-English description for every vote cast by every member of the Michigan Legislature since 2001. The second is Michigan Capitol Confidential, a periodical and daily online news source that gives more details on votes involving concerns regarding limited government. Do the lawmakers always vote with their party, no matter what? If there are a handful of dissenting votes for or against the limited government side of an issue, which side do they tend to fall on? Do most of the bills they introduce expand the size of government, or reduce it? 4. Tea Party activists follow the money. 5. 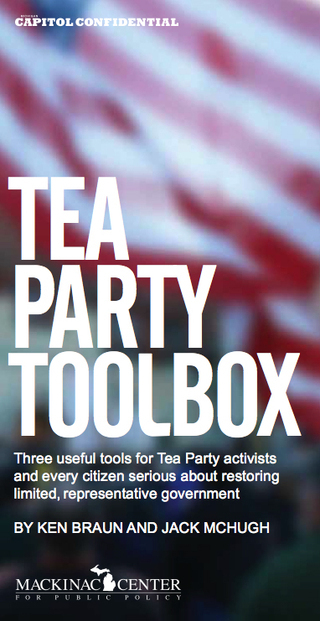 Tea Party activists know they don't have to get elected to change the world. More often than not, the most important effect of an election is who gets defeated, not who gets elected. When a politician loses for "doing the wrong thing" the incentives change for all of them. 6. Tea Party activists don't 'repress their feelings' regarding fiscal malpractice. Having discovered the real records of elected officials in their own area and elsewhere (see Items 3 and 4), Tea Party activists share this knowledge widely with friends, family, colleagues, internet contacts, etc., letting all and sundry know how their lawmakers are behaving, and sharing their feelings regarding the ones who are misbehaving. Grievance: Chronic fiscal irresponsibility, now become acute fiscal extremism. Target: A self-serving, self-perpetuating political class that no longer represents the will of the people. Goal: Restoring genuine representative, limited government by changing the incentives for elected officials.